stew, chock full of succulent slow-cooked pork shoulder in a rich, spicy sauce made with tomatillos and peppers. This stew is most famously known in New Mexico, where it is practically the official state dish. You can see this meatless green chile sauce on almost every menu in the state. It is like a flavor-punch gravy that goes with so many things. This simple, rustic full-of-flavor dish is the kind of cooking I love. This is food that is a lot like me: it fits in perfectly fine at a gourmet dinner party and is just as at home around the campfire after a long day of hiking. 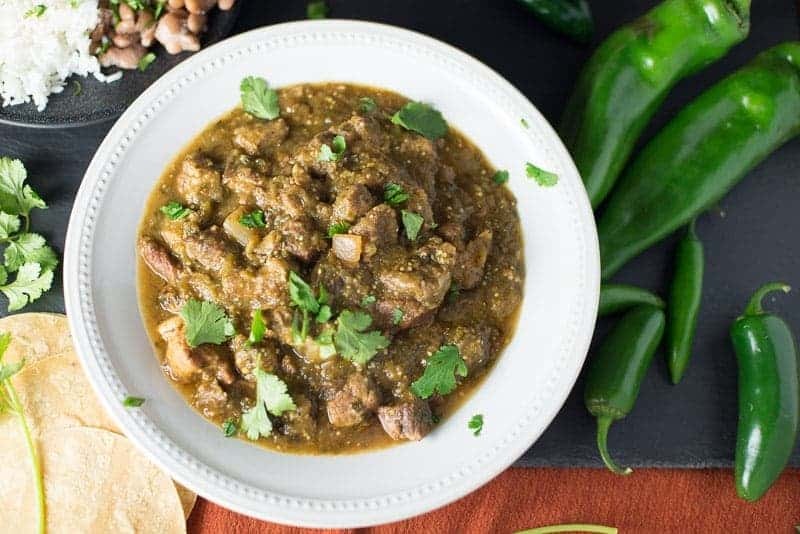 I am a big fan of a rich stew of any kind, but Chile Verde might be my favorite. Typically I will serve this with corn tortillas, rice and beans, and a cabbage slaw. 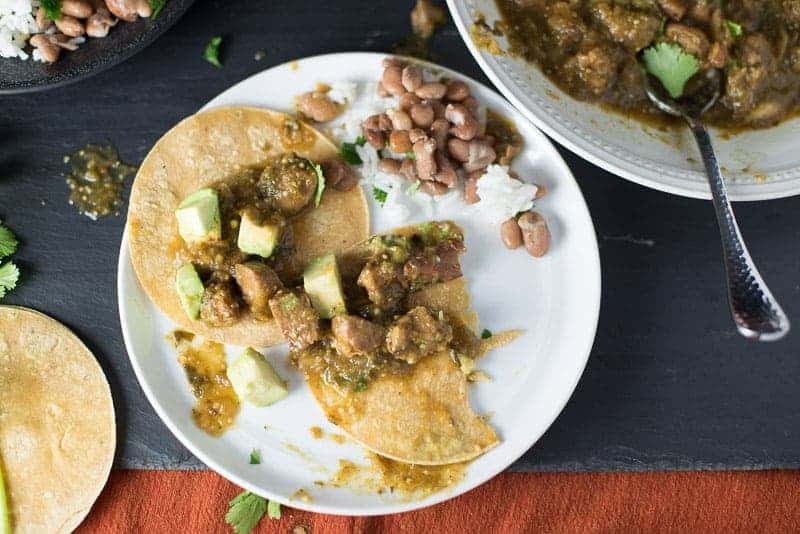 We have previously discussed my obsession with tacos, so it should be no surprise that I am going to make this into a chile verde taco situation. Adapted from a recipe given to me by my good friend Ron. And a few suggestions from my favorite butcher Miguel. Disclaimer: I used Ron's ingredients, added a few serranos for extra spiciness, and I made up my own directions because I play by my own rules. Place foil over the baking sheet and let the peppers and tomatillos sweat until cool. While browning the pork shoulder work on removing the skin and seeds from the peppers and the core from the tomatillos. Make sure to reserve all the juices! Trim and dice pork shoulder into knuckle sized pieces. Use the trimmed pork fat for browning the meat. Do this by placing the trimmed fat into your dutch oven and cooking it over medium heat until some of the fat has rendered out. Remove the fat pieces and add in the pork shoulder. Salt and pepper pork, and then brown pork on all sides on medium high heat. Remove pork from dutch oven. Set aside. Drain off the majority of the pork fat from the pan. Reserve a little for carmelizing the onion. Add peppers, tomatillos and reserved juice to the caramelized onions. I use a stick blender here to puree everything. If you don't have a stick blender make sure to rough chop all the peppers before you add them back to the pot and squish the tomatillos well with your hands as you add them. Add the chicken stock. I add enough to cover the meat. Give everything a big stir. Add bay leave, garlic, cumin, and oregano. Bring to a boil. Cover and reduce to simmer for about 2 hours. You will want to cook this until the pork is tender. If you need to reduce the sauce, raise the heat and cook with the lid off until you reach the desired consistency. Chile Verde can be made with no meat at all, as a sauce that's a great addition to almost anything – my favorite is eggs. This can be eaten in bowl like chili with sour cream on top. But my favorite is serving it with rice and beans and tortillas.